Academic librarianship has an intimate association with narratives and stories from their traditional role in curating, caring for, and making collections accessible. Librarians also experience the intricacies and challenges of narrative inquiry through the qualitative research they undertake, oral histories they gather, reflective teaching practices they facilitate, and oral-traditions they interact with. Despite these intersections with reflection and narratives, academic librarianship, and library sciences as a whole, have not fully incorporated their own narratives within their practices. Academic librarianship has the ability but not the spaces to critically reflect in a holistic manner. Shadiow (2013) encourages us all to “recall, retell, and then scrutinize your stories” (p. ix) through critical reflection. One potential method to accomplish this task of “scrutinizing our stories” is the reflective technique known as currere. Grumet (1976a) suggests that currere allows us to put our “essences back into existence” (p. 41). Currere provides a pathway to putting ourselves back into librarianship much as it has done with other educators. 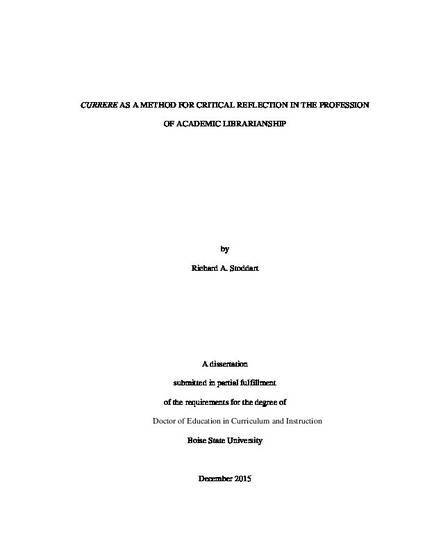 This study explores the use of currere with a group of practicing academic librarians by the application of a reflection curriculum over a twelve week period. The central research question of this study seeks to answer is: What does structured, holistic, and critical reflection, such as currere, reveal about librarianship?